Available now at Na Mea (Ward Village), Sugarcane Shop (Kaimuki), online booksellers and Amazon Books. Following is a Synopsis, Book Specs, About the Author, Review Quotes and Graphic Materials. Strange things are happening in Hawaii! Silicon Valley refugees have invaded a high-tech hippie cult with dreams of revolution and a new island utopia. In this fast and ferocious tale of mystery, romance and thrills, Hollywood's go-to guy in Hawaii, Henry "Waimea" Ward, must puzzle the pieces to find a missing girl and save the island, and the women in his life, from destruction. His teenage goddaughter is a force of nature. His actress girlfriend has island fever, while the embers of his first love are starting to burn again. 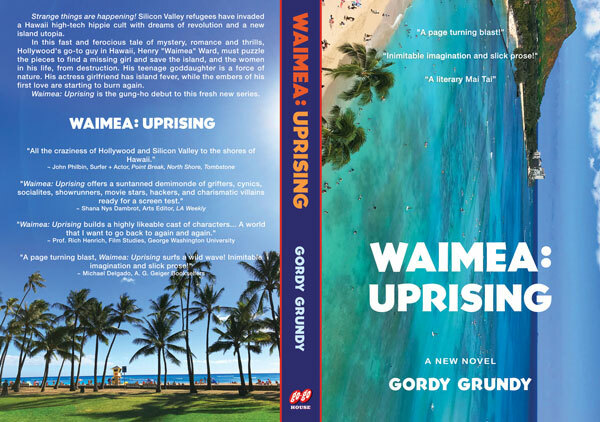 Waimea: Uprising is the gung-ho debut to this fresh new series. "All the craziness of Hollywood and Silicon Valley to the shores of Hawaii. 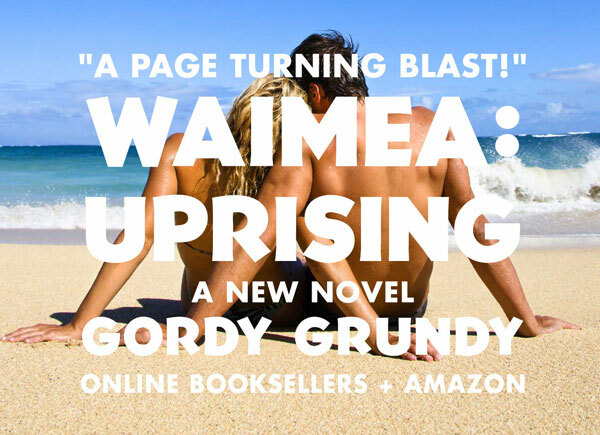 "A page turning blast, Waimea: Uprising surfs a wild wave! Inimitable imagination and slick prose!" 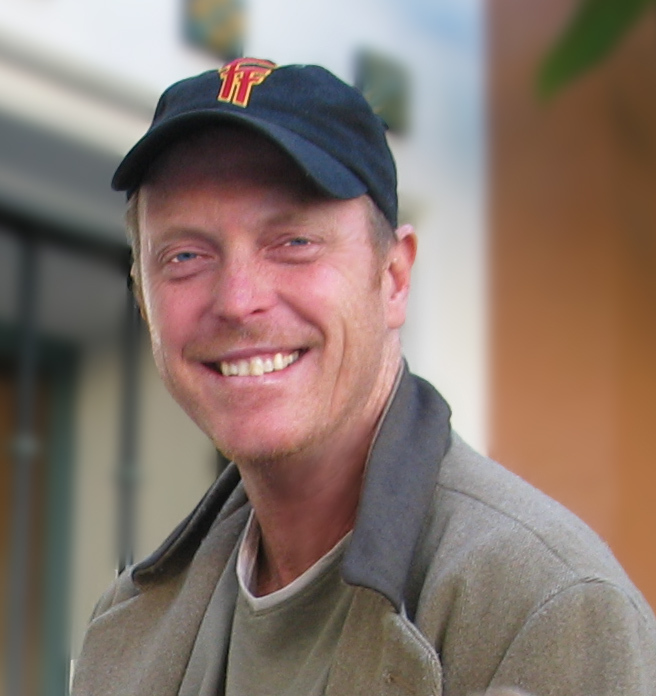 "Author Gordy Grundy is a student of human foibles. His absolutely original voice, forged in the crucible of the LA art world, rollicks across a sort of Gonzo-style Postmodernism, with a careening appreciation of Dadaist absurdity, and a painterly knack for exacerbated detail. Part Elmore Leonard, part Hunter S. Thompson, equal parts Carl Hiaasen and Dorothy Parker, Waimea: Uprising proves that Paradise too has a seedy underbelly -- a suntanned demimonde of grifters, cynics, socialites, showrunners, movie stars, hackers, and charismatic villains ready for a screen test." 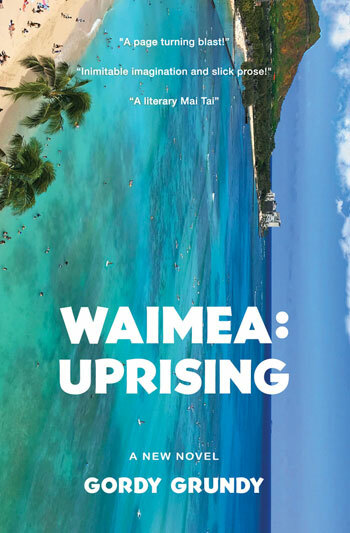 "Waimea: Uprising builds an intriguing environment with a highly likeable cast of characters in a fascinating island reverie. Like a binge-reader with a book to burrow, I want to spend more time, there, with them. Gordy Grundy creates a world that I want to go back to again and again." "Keep your eye on this arts provocateur at all times." GORDY GRUNDY is an American artist and arts writer. He has been influenced by sunny flights of SoCal fancy, lost causes, the bold stroke and the beautiful gesture. The Southern California sensibility has always been his touchstone. Light & Space, Minimalism, Finish Fetish, Hollywood, Disney, the secrets of re-creation and the Healing Power of Pop continue to fascinate him. After more than a decade as an arts journalist and twice a first-read columnist, he has written for Artillery magazine, the Huffington Post, the Los Angeles Times, the LA Weekly, ArtNews, the Coagula Art Journal and many others. 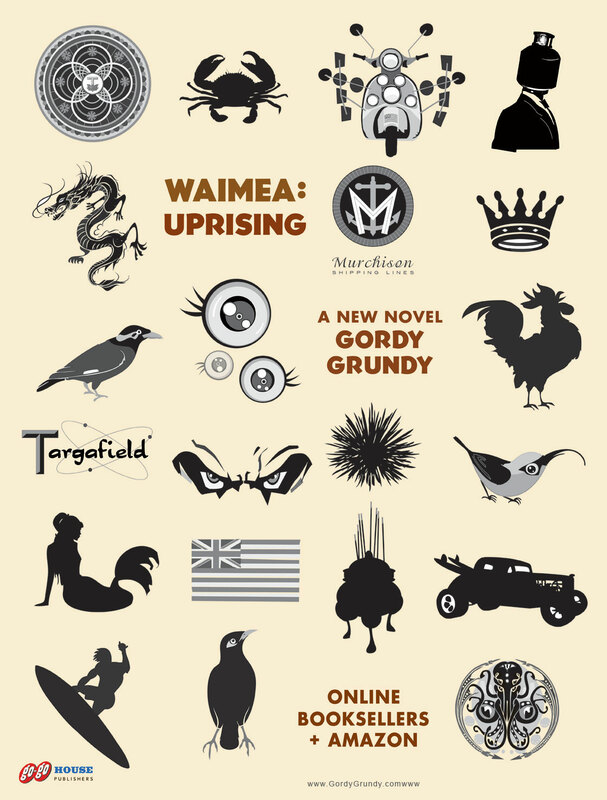 No stranger to fiction, Waimea: Uprising is his longest work to date, and therefore, his first novel. He is the author of non-fiction Blood and Paint: Essays on Art in Los Angeles, Artist's Pants, Aquarius Rex and the anthology Gen F.
One of his favorite and most philosophical creations, No Further West celebrated its 20th Anniversary in 2017. The large, gold leaf, minimalist painting, hangs at Traxx Restaurant in Union Station, Los Angeles. "Arts humorist Gordy Grundy has written his first novel. Several years ago, the visual artist and columnist left the Los Angeles contemporary art world with BURN, a retrospective show of 200+ artworks—what didn't sell, he burned. He then headed west to the South Seas where he put pen to ink and created Waimea: Uprising his first novel-length fiction. Keep your eye on this arts provocateur at all times."